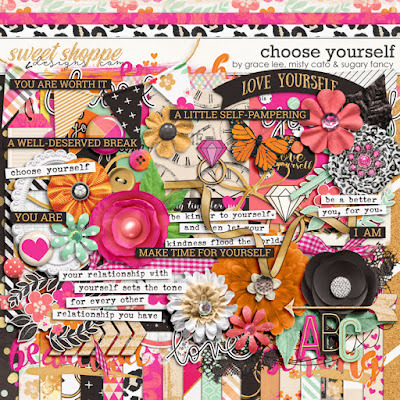 Choose Yourself by Grace Lee, Misty Cato, and Sugary Fancy is a super inspiring kit and it is perfect to scrap about yourself! and 79 elements. The elements include 1 butterfly, 1 bow, 3 buttons, 10 flowers, 3 leaves, 1 crochet heart, 3 3x4 journal cards, 1 lace, 4 ribbons, 3 paints, 1 doodled ring, 3 painted titles, 9 word strips, 1 bead scatter, 3 frames, 1 heart stamp, 1 circle titled tab, 5 blank (different colors) circle tabs, 1 string, 1 tag, 2 washi tapes, 2 arrows, 2 banners, 3 doodled words, 1 confetti scatter, 2 flairs, 1 heart, 1 scribbles, and staples.